Style, sophistication and an incomparable location put this superbly presented 2-bedroom sub-penthouse apartment in a category of its own. With floor to ceiling walls of glass serving up spectacular CBD views, two balconies and spanking new décor throughout it’s set to impress. Plus you’re located in the 4-star Waldorf Celestion Hotel, surrounded by everything the city has to offer. Corporate towers, the waterfront, Queen Street and more – all you want for a business trip or a weekend in town. Take it as a romantic reward for 2 or a family break for 4, either way you’ll be coming back for more. Walk to a host of fabulous restaurants, from Café Hanoi (buzzing with atmosphere) to the European ambiance of new kid on the block, Amano. Book a table with a view at Josh Emett’s Ostro or stroll to the Viaduct for evening cocktails. Take in a show at Spark Arena, go shopping on Queen Street or try the bright new stars in Britomart. It’s all here, within walking distance of your splendid pad. TV with all free view channels, sky channels and FREE WIFI. The modern living room has a comfortable sofa, coffee table and dining table. The kitchen is fully equipped with everything you need - the supermarket is just a short walk away so you can cook to your hearts content. The master bedroom features one super king size bed. The other bedroom comes with one king single bed and a single bed (a permanently set up fold out bed). For your peace of mind and safety we have smoke detectors and a tamper proof MethMinder - this means you are protected against smoke or drug related toxins whilst staying in this apartment. Two balconies leading off the two bedrooms. One of each side of the property giving two different exciting views of Aucklands skyline. 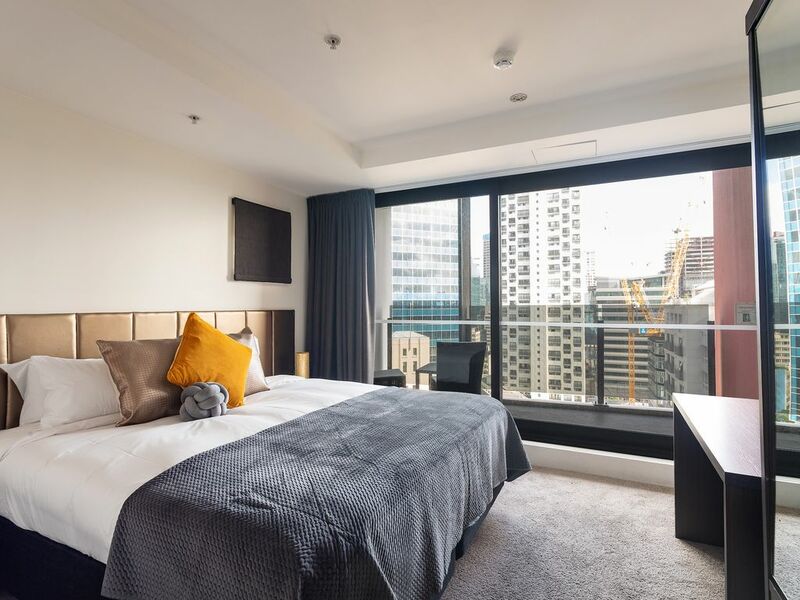 Please note NO PARKING is included with this flat and parking in Auckland CBD is expensive. There is a parking lot across the street which charges $45/24 hrs or $15 overnight. Overall I spent about $70 on parking for 2 days. The flat is nice, the pictures make it look larger than it is. The carpet was fairly dirty and stained and hadn't been vacuumed in a while. For $100 cleaning fee I would expect this to be done after every guest. Our stay was fine but I would not stay here again. Thank you, Cheryl, for staying at our property and your review. We appreciate your comments regarding the car parking and its high cost, this is why we do not advertise the property as having parking so that we do not mislead guests. Unfortunately, the carpet has recently fallen victim to previous guests who broke our house rules which resulted in some staining. We have a carpet cleaner booked to do a thorough clean of the properties carpets but with back to back guests have only been able to schedule this for next week. We were shocked to hear that you felt that the carpets were not vacuumed, had this been raised with us during your stay we would have sent a team over to re-do them immediately. Our cleaners vacuum and clean thoroughly after every guest but we will ask them to check the carpets further in the future and make sure that we check their work too. Thanks so much, The Toodle Team.